Hey, y'all-it's a blog tour!! This is my first one ever, so I'm excited. And it's even more exciting that it's someone as awesome as, Terri Bruce author of HEREAFTER. 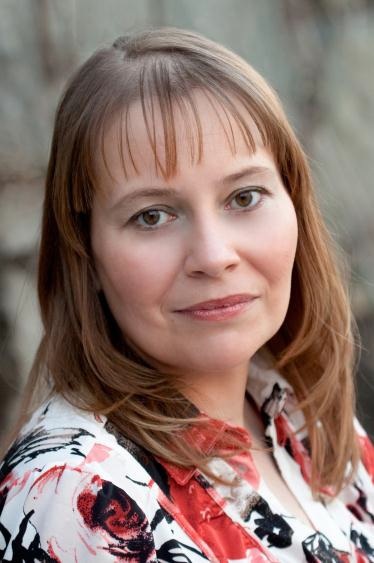 Terri's going to tell us her top ten movies containing ghosts and the afterlife. I think hands down Spirited Away is my favorite movie about ghosts. I love Miyazaki films anyway, and then when you add in the rich and beautiful spirit world he has created in this movie, this one becomes one of the richest depictions of the spirit world on film. I especially love the idea that the spirits need a bath house—a place where they go to relax and rejuvenate. Now, (SPOILER! ), technically Reese Witherspoon is not a ghost in this movie, but we (and she) don’t know that until the end. Not only is this movie super sweet, but the scenes of the various psychics that Rufolo calls in to rid his apartment of Witherspoon are hysterical! It’s fun to see the “ghost’s” reaction to all of the ghost repellent charms. This may be one of my all time favorite movies and probably my favorite depiction of the afterlife. I love the idea that the entire point of everything is live without fear, though I cringe at the thought of having to re-watch certain parts of my life and then defend my actions or choices. Hopefully, I’ve grown and improved over the years, but that doesn’t make the places I’ve stumbled any easier to relive! This movie has a very interesting take on ghosts—I love how, at first, they are just hanging around. No one can see them or hear them, so being a ghost is obviously extremely boring. They have unfinished business and they can’t move on until they complete it. What I find particularly fascinating was how the ghosts seem to have extremely little interest in the world of the living. They’re dead, they know they’re dead, and they all seem perfectly fine with that. They just really want to finish up their business and get going. Beetlejuice seems to be on the opposite end of the spectrum from Ghost Town—these ghosts DO want to interact with the world of the living; or, more precisely, they want to hang onto their earthly/worldly possessions. There is no “moving on” here; the Maitlands are apparently stuck in their house until the end of time and they have no intention of sharing with the living. What’s also funny is that in this version of the afterlife, the dead are trying to exorcise the living, rather than the traditional other way around. My husband thinks this is a terrible movie—Mary Steenbergen is lead to believe that her husband dies, that she loses her job, and that her children are kidnapped (and nearly die), just to teach her about the spirit of Christmas—but it’s always been one of my favorites. In this movie, we have the idea that the dead serve as guardian angels, watching over the living. Harry Dean Stanton as the “angel” is a strange and fabulous casting choice—who can resist? Here we have the traditional “unfinished business” view of ghosts with the added twist they can interact with the physical world—they can open and close doors, cabinets, even drawers. We also have the element that some people can naturally see and talk to ghosts (as in Ghost Town—there, the ability to see ghosts is created by the character’s near-death experience. In this case, it appears to be a natural ability), which has been used in other movies, such as Ghost and the Frighteners. Here’s a movie (based on the James Joyce novel, “The Turn of the Screw”) where the ghosts aren’t the main characters—this is not a story of the living battling the dead or of the dead reconciling themselves to death. Instead, what we have here is a story in which the “ghosts” are symbolic representations of the Victorian fear of death, repressed sexuality, and mental instability. In fact, the ghosts may not even be real. In some ways, that is much scarier than an actual horror movie, where one knows the ghosts are real. It’s hard to fight external forces when you’re not clear if they exist or you’re simply imagining things. Now I hate to stereotype, but hands down, the South Koreans are the king of horror movies—they make some damn scary stuff! All of these movies scared the beejeebers out of me, particularly The Ring. Here we have some typical “horror” type depictions of ghosts: ghosts are scary, malevolent, and have supernatural powers (super speed, super strength, ability to fly, crawl out of televisions, and hide under kitchen cabinets). Here ghosts are depicted as simply annoyances to be removed, akin to roaches or mice. We see a variety of spirits—some that are clearly dead humans and some that don’t appear to have ever been human—but the movie remains extremely tight-lipped on the existence of an afterlife and what happens to us once we die (does everyone hang around as a ghost or just some people? If just some people, why do those people end up here, rather than moving on?). I'm thinkg Ghost with Demi Moore and Patrick Swayze. It may be cliche but I still love the unfinished business with ghosts. I'M SHOCKED CASPER ISN'T ON THIS LIST. What about The Others? That had a great twist!! Ghost. I had a HUGE crush on Patrick Swayze-between this one and Dirty Dancing . . . oh man. Thanks for the giveaway! 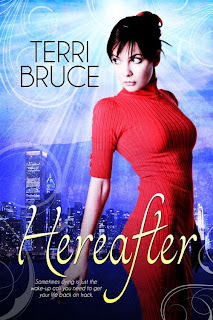 Hereafter sounds like an enjoyable read! Apparently I don't watch too many ghost movies - I've only seen one of these. And I did see Ghost too. I'll have to check some out! Good luck with the tour & the book Terri! Favorite ghost movie, eh? I agree with a lot of Terri's choices, actually, for a variety of reasons: Ghostbusters has that fun para-scientific vibe; Spirited Away is a fantastic coming-of-age tale; Beetlejuice enjoys a quirky reverse-psychology of the undead (plus some great Belafonte tracks! ); and Sixth Sense - despite the "twist" - has some really poignant observations about life and purpose.